WW1 Reenactments Equipment : Great War Tommy WW1 Documents, Paperwork : Soldiers Leave Guide to London, booklet cover. 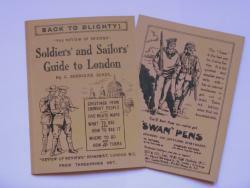 WW1 Reproductions and WW1 Reenactors Equipment / Kit - Soldiers Leave Guide to London, booklet cover. Soldiers' Leave Guide to London, booklet cover. "Back To Blighty!" Soldiers' and Sailors' Guide to London. A 'Tommy' and a 'Tar' on the back cover advert. "What to see and how to see it. Where to go and how to get there and greetings from 'Eminent' people" (Whoever they might be?!) Cover only.